Take the world by storm with custom playing cards. Gain the attention of everyone with stunning graphics printed on your playing cards which are a proven way to get the party going. With our high quality printing procedure, your playing cards will come to life jumping of the premium card stock used impressing everyone that holds them. If you have your own artwork, great. If not we have a team of graphic designers waiting to create dynamic images for you on your custom playing cards. 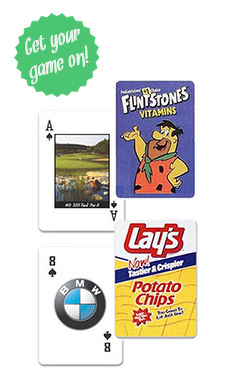 There is not any situation we can think of where printed playing cards wouldn't be a party starter insuring everyone at your event has a good time. These custom cards make awesome yet inexpensive gifts for everyone to remember your name.